ORLANDO, FL--(Marketwired - October 15, 2013) - Southwest Airlines Vacations is offering travelers an opportunity to book their next ski trip now, with $75 package savings on ski vacations to Reno Tahoe. With exciting casinos, world-class shopping, nationally recognized, award-winning dining, and easy access to the nearby ski resorts, Reno is the perfect destination for those looking for a combination of ski adventures and fun nightlife. Just a short drive from some of the best ski runs in Lake Tahoe, a Reno Tahoe ski vacation offers great savings and convenience to all the snowy action. Guests who book a flight plus hotel vacation package for three or more nights to Reno Tahoe can save $75 per reservation when using the promotion code RNO75 at the time of booking. Plus, they can get additional hotel savings when staying at select Reno hotels. To take advantage of this Reno Tahoe ski vacation deal, travelers must book their packages between October 15, 2013 and October 28, 2013 by 6:00 p.m. Central Time for travel October 16, 2013 through March 31, 2014. One-day advance purchase is required. Restrictions and exclusions may apply. Travelers can make the most of a Reno Tahoe ski vacation by bundling add-ons like ski lift tickets and ski or snowboard rentals to make a complete vacation package! Plus, they can make transportation around Reno Tahoe a breeze by adding a rental car to their vacation package. Customized vacation packages include roundtrip flight via Southwest Airlines® to Reno and hotel accommodations (including taxes). Plus, first and second checked Bags Fly Free®-savings of up to $120 per person, roundtrip. † Even Skis and Snowboards Fly Free®. Visit the Benefits of Booking a Southwest Vacation page to learn more about everything included in a customized vacation package. 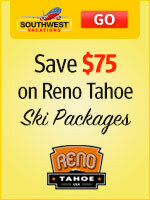 $75 per reservation promotion code savings apply on flight + hotel vacation packages to Reno for three or more nights. Savings is reflected in the package price when using promotion code RNO75 at the time of booking. Length of stay for flight and hotel components must match. Promotion code intended for redemption by individual consumer only. Savings valid if booked between October 15, 2013 and October 28, 2013 by 6:00 p.m. Central Time for travel October 16, 2013 through March 31, 2014.